ArtRage for Android offers the same range of realistic, traditional painting tools as ArtRage 4, as well as more digital editing tools such as the Sampler and Fill tools. Oil Brush: A paintbrush that places thick or thin oil paint and allows smearing and blending. Watercolour: Paint with a variety of watercolour strokes using a soft bristled brush wet or dry paper. Airbrush: Sprays a thin mist of colour onto the Canvas. Palette Knife: Smears thick paint around or smudges thin, dry paint with its flat blade or edge. Ink Pen: Creates bold, solid ink strokes with optional smoothing and tapering. Felt Pen: Creates translucent felt pen strokes with adjustable wetness and blending. Gloop Pen: A special effect pen that produces expanding blobs of ink on the canvas. Pastel/Chalk: Creates waxy or chalk strokes that react to canvas grain. Glitter: Sprinkles coloured particles of glitter of various shapes onto the canvas. Paint Roller: Makes broad strokes of evenly applied paint. 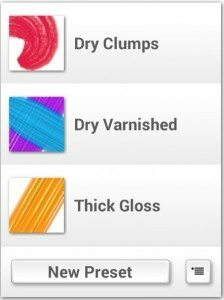 Paint Tube: Squeeze out thick lines of paint for dramatic textures, colour mixing, and impasto effects. Eraser: Erases media from the canvas, with adjustable pressure and softness. Fill Tool: Pour large areas of paint onto the canvas to block out areas of colour. Colour Sampler Samples colour from the canvas, allowing you to pick the colors to paint with. Tool Settings: The Tool Settings panel lets you adjust various properties of each tool. By changing settings you can create a wide range of different effects. For example, a dry oil brush with thinned paint looks very different to a heavily loaded oil brush using thick paint. Tool Preview: This shows you what the tool stroke will look like. Type Picker: One of the types indicated to select it, the name of the type is shown at the top right. Slider: Tap and drag to change the value, or tap the number to enter it manually. Toggle: Tap to turn the feature on or off. If the button shows a tick, the feature is turned on. Reset: Tap this button to reset the current tool to default settings if you ever need to. Tool Presets: Tool presets are a quick way to store settings for a particular tool. When a preset is activated, all of the settings that were stored with it are restored. Adding a new Preset: To store the current tool settings in a new Preset, tap the New Preset button. A panel will appear that allows you to enter a name and pick an area of the canvas to use as preview. 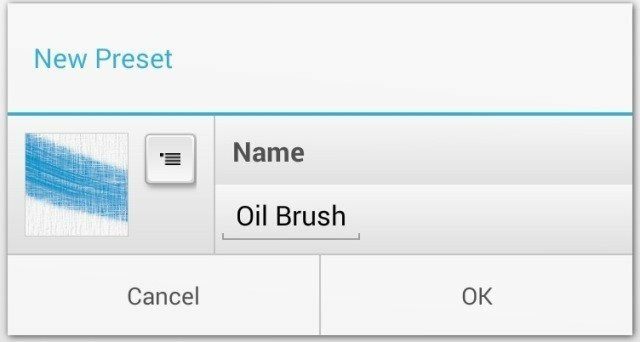 Tap the preview image to choose an area of the canvas to use, and tap the name area to enter the names your new Preset.